← Finding your inner kid: where did all the snow go? I’d seen the catalog images hundreds of times. The classic LL Bean Barn Coat. Worn by handsome, rugged guys with peppered hair, stubbled faces and crow’s feet that deepened the harder they would smile at the camera. The backdrops of their imaginary lives, idyllic rural landscapes painted in autumn colors or with fences lining fields of grazing horses. The assumption was rural New England or Bean’s hometown state of Maine but it could have been anywhere, left purely up to the imagination of the reader, the buyer, the consumer. Granted, they were models, likely from the famed Ford agency in Manhattan, but I wanted to be those guys, to wear that coat and be rugged and handsome and capable. To work hard and play hard, to be one with the outdoors, to drive a pick-up truck on dirt roads and do jobs worthy of wearing an LL Bean Barn Coat, a coat that combined classic fashion with heavy-duty, rural durability. I bought myself an LL Bean Barn Coat somewhere in the mid 1990’s. I don’t remember the exact year but it was close to twenty years ago. My choice, the traditional Khaki color with the hunter green collar, a coat made from heavy canvas, with a removable, insulated flannel liner and deep front pockets that would keep my hands warm on cold Fall Michigan days. I was young, mid-20’s, newly married and kid free. I had a new career under my belt and endless possibilities on life’s horizon… and now I had an LL Bean Barn Coat. For many years it was my regular coat. I wore it to work and I wore it on dates with my wife. I wore it to restaurants and the grocery store and on trips back East to visit my family. I wore it to apple orchards and pumpkin patches and while shoveling snow in the winter. I probably wore it to the hospital when my daughter was born in 1997. I wore it while working around my house, while chopping wood and raking leaves and repairing fences and painting barns and mowing grass. Over the years my LL Bean Barn Coat became less and less my everyday coat and more and more something I wore when I knew I was going to get dirty. It had become permanently stained with dirt, splattered with red barn paint and faded from long days in the sun, the rain, the snow and trips through the washing machine. Plus, like most people, my attitudes about fashion fluctuated from year to year and some years I was much more fitted dress shirts than flannel button downs, and much more black leather jacket than khaki LL Bean Barn Coat. But my trusted coat is still with me, it still hangs proudly in my mud-room and close to twenty years after purchasing it, I still wear it regularly when I am doing jobs that are worthy of wearing an LL Bean Barn Coat. I’m a much different person now than I was in my mid-20’s and I like to think that, just like my LL Bean Barn Coat, with its dirty, stained and faded patina, I have aged gracefully, not only on the outside, but the inside as well. I’m not sure I ever became one of those guys in the LL Bean catalog or if my life has developed into the storybook that those images in the catalog portrayed. Sure I have the crow’s feet and a few gray hairs and the rural life and the dirt road and the pickup truck. In reality though, if I can claim to be anything like the guys in those pictures, I know where credit is deserved; the woman I married, the family she and I have built and fostered and my general attitude about life and how I have chosen to live it. Because a fulfilling life has much less to do with the coat you wear and much more to do with where you choose to hang it. Just followed you on twitter. Great! Even though about once a day I think about closing down that account. Great post, Steve. I feel like I just got to know you a little better through the life of your coat. I wish I had a coat w/ that history. . . Thanks Jared. You may not have a coat, but I bet you have something around the house with some history. Maybe a guitar? I have many coats, but they’re all in one place, so I guess I’m good to go! Dood, I only know you from your blog, but yeah I think you’re good to go! You need to get him a black leather jacket!! It’s odd. I can’t even picture him in a leather jacket. Something to aim for. LOL! I bought mine of a whim about five years ago, probably part of the whole midlife crisis thing. I LOVE it. It’s sort of classy looking, not like the old Fonzy jacket. I look great in it if I don’t say so myself. Those guys in the catalog are overrated. I’m sure you’re fine just as you are. Yeah, I think I turned out okay! Thanks! Stories about items and the stories they tell about us are among my favorite things to read and write. I wrote a post once about the places a trusty pair of running shoes had carried me over. Thanks for the great read! Sounds cool. Running shoes are the perfect “vehicle” for a post like that! There was a great post on WordPress a month or so ago about a pair of boots. I liked that one a lot too. Thank you, that’s very sweet. Beautiful, warm. I want to read all your stories now. Glad I found this one. Thanks. They’re not all beautiful and warm but I’d encourage to poke around. Thanks for visiting! Thank you, I enjoyed that very much. I had a cashmere overcoat that carried me through many and English and French winter…finally to be passed on when moving to Costa Rica. But I still have my trusty old Australian Driza-bone. there’s a lot of memory in old coats. IF only your LL Bean Barn Coat could talk. I bet it would have some wonderful stories to share, don’t you agree? I really liked your post ,it was thought provoking. For me fulfilment in life is more about what we do and not about how we look. As we get older I think it becomes less important to have the trappings of an image to protect who we are. We grow into ourselves. I have a ‘Stockman’ that I used to wear religiously to work and on days out. I felt good in it and believed that it conveyed the image of a confident, self assured person who was slightly ‘of the wall’. I still wear it, not to create an image, but to protect me against the rain. I will probably have it for a lifetime……..they are designed to last, but it has ceased to be a badge of who i am. You make a great point about how aging makes us look at things differently. Perhaps not always for the better, but most of the time it is. What a great story! Congrats on being Freshly Pressed — a well-deserved honor! Thank you. I liked this post a lot, glad it’s being read. It’s our choices, and you’re right, where we choose to hang our jackets that makes all the difference. Great way to connect the jacket to the outcome of one’s life. Thanks for the great post. You write beautifully. Thanks Mikey. I’m guessing from your nice comment you have found a good place to hang your coat. I have a jean jacket that I have carried around for over 15 years. It stood by me when people didn’t. I love your post! Thanks! I’ve never had a jean jacket but always thought they looked cool. Its one of those jacket styles that only certain people can pull off. Glad yours has held up well! I couldn’t love this post more. Congrats on the FP, Steve! Darla! Whew…a familiar face. Figured you might connect with the whole Bean thing. I was thinking though, never being FP’d was one of my schticks. Gonna have to come up with a new idea now! Enjoy it! Very well deserved FP. It’s about time! Good writing as always. I have to say, anything about Bean’s brings up childhood memories. Your story takes me back home. Thank you. Where’s home? In the country somewhere I assume? Such a great post. Don’t you love how one piece of clothing can become such a part of who you are? I have a scarf that, even though I’ve only had it for about four years, seems to have taken on a permanence in my life. I trust it. It makes me feel comfortable. I read your “About” page. Great stuff. People, you should read this girl’s “About” page! Great post! I can really relate my friend. My “barn coat ” is the hat I am wearing on my gravatar. I rarely wear it these days. But after thirty years of loyal service I dust it off occasionally and take it for a ride. Looks like a great hat! Someday I want to have a long gray beard like your’s too! HAHAHAHAHA!!!!!! I can hardly grow a beard my brother. That’s long grey hair!! It was just hanging a little loose that day. Too funny, guess I shoulda looked closer. I still want a beard like that though! Oops I got cut off. I had an aviator type leather jacket that was my barn coat. It was stolen in a dirty bar someplace in IL probably close to the same time you bought your coat. Your post made me smile thinking back to the great times I had in my coat. Makes you wonder who, what, where it ended up, doesn’t it? I have a great black leather jacket that I like to wear. About the polar opposite of the barn coat. That was first-rate. Well done! Fun post! My husband has the same coat — and wears it into NYC to work at a daily newspaper. Not very rugged, but he looks good in it. I scored a great version of it at a truck stop in Arizona for $20; it cost me more to get the sleeves shortened than the original price. Now all I need is the ranch/dog/horse/pickup to go with it. The style with Bean, at least, has been around forever. I think they call it an Adirondack coat now, rather than a barn coat. You may have had to pay extra for yours but it will last forever. Thanks Tony, sounds like you got your money’s worth. I can’t seem to get this one to fall apart. Very cool… I too have a similar coat. Only mine was an anniversary gift from husband… And it’s a Carhart. But trusty and warm. Carhartt is a great brand. I have one of those Carhartt full body jump suits. One of the greatest investments a guy (or girl) can make. I can wear that thing on the coldest winter days and as long as I have good boots and gloves and a hat I could stay out forever. We camp sometimes in the dead of winter and I wear it then. Carhartt is a great brand, see comment way above about my Carhartt jump suit. Anyway, LL Bean is national brand too, but a little more New England and East Coast. I grew up on the east coast and went to school in Maine so I have a lot of connection there. Didn’t read all the comments above. Funny you have a Carhartt jump suit. Guys down here RARELY wear those. Today was the coldest in a while. I think the high was 60 or something. But seriously, I doubt that most of these ranchers around here have heard of L.L. Bean. 😉 Funny story: About a month ago, when it was actually chilly, I was driving though La Grange and EVERY single man I saw in parking lots and on the street was wearing an identical tan Carhartt jacket. Every single one! It cracked me up. Wanted to share it with someone, but forgot about it until I read your post. Thanks for the memory. Haha! Mine is great, keeps me warm, but the best ones are the bibs (with a jacket over it) so if you start to warm up you can at least take the jacket off. Funny story you told, there’s some places around here where I wouldn’t be surprised to see that. Around here though all the jackets would be hunting camo! OMG, I briefly lived in Arkansas last year (all Carhartt area) and, no kidding, EVERYONE wore camo every day, for every occasion. I was never sure if I was in public or in the forest, even in a Super Wal-mart (only store for miles). And a friend of mine was a pediatrician in Oklahoma for a while. No kidding: They put either pink or blue camo on the babies in the newborn nursery! Bwahaha! So funny, right? I love how you wove the imagery through your story and ended with a nice statement about life. Hi Susie, thanks for the nice comments. I guess I thought you were following already because you’ve been around before. But thanks! I thought I was following too. Well I am now! Enjoy the influx of new readers! Woohoo! Reblogged this on zalaaaan's Blog. Nothing like a good winter coat. Thanks for the read. I have a massive black Cohart Jacket bound to be like your LL Bean Barn coat, and I’m mid 20’s wearing that Cohart everywhere I go :).. Its love. Carhartt is great stuff, lots of mentions about the brand in the comments. It’s actually a little tougher and more manly than the Bean stuff. Carhartt is really made for guys and girls working in the trenches!! Insightful, well written, and compelling; this is one of my favorite “Fresh Pressed” of all time. Wow thanks, that’s very sweet. Now, that’s what a coat should be used for! And its true! Thanks for reading. I really loved this. I love the idea of a coat or a pair of shoes being with you for years, absorbing all the knocks and bumps of a life and ageing and developing a character, just like their wearer. If we all looked in our closets there’s probably at least one thing we could find that would have enough history to make an interesting story. Thanks for reading. I have a chambray shirt too, that I wear alot. Its become very soft and warn and faded. I like it! My wife had the girls version of the barn coat for a while, not sure actually if we still own it. Thanks for reading! You have a wonderful blog. Happy Valentine’s Day! Thanks… and to you as well! Thanks for reading. Thanks! Interesting comment about your friends wearing your jackets. Of course, kids don’t wear jackets much these days, instead they wear hooded sweatshirts. But seems like my daughter and a friend of hers are always trading clothes. Nice story. You could write for the Peterman’s catalog. Seriously, I buy clothes there just because of the descriptions. Several people have mentioned Peterman’s. Gonna have to admit to y’all that I don’t know what that is, but sounds like the catalog is fascinating in itself. Now off to Google to learn more! Loved this post. So nice to know someone out there feels the same twangs of past to present. I look at how I’ve changed over the years and am happy to say I cherish the patina and the memories. In my closet hangs a Leather jacket I bought from Banana Republic back in ’87. In those days they were a small mail order company with only sketches of their clothing and really cool descriptions. Their lines were a cross of LL Bean and Australian Outback. Sadly when the company became “Malled” they lost me. Whatever, I still love my jacket with it’s rips and knicks and it’s travels through my life. Can’t tell you when the last time was I wore it but I can tell you I’ll never toss it. Wow, Banana Republic! Cool store but I haven’t been in one in probably close to 20+ years. So I have no idea what they are like now. As you said… “malled”. Eddie Bauer, another example of that. Also, you can write 🙂 And how! Congratulations on a wonderful post and the well deserved Freshly Pressed 🙂 Loved the last line! That last line is a keeper! I was just writing a post about all the great bloggers who have never been Freshly Pressed. I was going to link to your blog. Now I have to remove your name. I’m sorry. I read your post, will be over there shortly to comment. Margie! What am I going to write about now that I can’t write about not being Freshly Pressed?!?!? We want to know all about what it is like to be Freshly Pressed. How does it feel, what are your stats like, what does it feel like the next day. We’re counting on you to tell us what it is like on the other side! I opened this post up to read it when it was first featured but then I had to go do something so I just now got to it. Love it. I too find lots of metaphorical meaning in my clothing…old pair of boots or a necklace someone important gave to me or just something I bought on a whim that ended up meaning a lot to me. The post was great. Very insightful and I could almost see the jacket wear over time! Boots are a great example of that… something about a pair of work boots or cowboy boots that just screams “history”! That’s chapter 2! This will be a whole novel about my coat… just kidding! I enjoyed reading around on your blog, and would like to follow it, but it doesn’t have a “follow” button to click — only one of those enter your email here forms. And I don’t want to enter my email there. I hardly ever look at my email, so what good would that do? I’d rather just have your posts come up when I click on “Blogs I Follow.” So, since I can’t click “follow,” and may never come across your blog again, I thank you for some good writing, amusing musings, and one hilarious picture of a squirrel. The follow button is in a header at the top of every blog with a little plus sign next to the word follow. It’s not part of my site, but part of the wordpress “background”. You can click “follow” up there and then posts will just show up in your reader, not via email. Oddly, it does not show up when I visit some pages, but it does on others. On yours, no (not for me, anyway). However, on your reply, there was a link, so, happily, I was able to click it. 🙂 Thanks! Nice. It brought back a lot of memories of my early life in Michigan. My uncles, cousins and family friends wore coats like that on the farms. Not L.L. Bean certainly, more like Osh Kosh or just the off the rack Kmart canvas coat. They worked hard in them, played hard in them and chucked them on the fence, tractor or limb of a tree when they got too warm from labors. Thanks for the trip down memory lane. Sometimes a coat is so much more than a piece of clothing, it is an album of where we’ve been and where we are now. WOW! I love this post! You write so well, really maintained my interest. Good work! Loved it! A beautifully written nostalgic memoir of values. Well done. What a lovely piece of writing. I have a red wool coat that has been with me for fifteen years and comes out every winter. Even though it is old and worn, I cannot part with it, do not want to part with it, and when I put it on it is with the familiar sense of coming home. It has travelled through life with me and I wonder what stories it would tell if it could. I wonder what memories it would have and what life looks like from its perspective. Beautiful post – I cried (sniff) – it was so honest and generous. Look forward to reading more now I know the road to here ..
Dar Williams has a song she wrote a number of years ago that has become my anthem (even in college when I was a 20-something and aging was not an issue… I loved it because it told me that I am loved in whatever state I find myself). It talks of the paradox of our perception in this world that as we grow older and stronger the “road signs point us adrift, make us afraid” and how she goes out with her paints and changes those “signs” to say “I’m so glad you finally made it here!” “With the things you know now, you know only time can tell.” “Looking back, seeing far, landing right where you are.” And, “You’re aging well!” It’s a beautifully written little song and your coat reminded me of it. So I thought I’d share. Congrats on being freshly pressed, by the way! Love the idea this ends on: less about the clothes than where you hang them! Great stuff. I may have to mention LL Bean in a post … if I could get on to Freshly Pressed. hee hee! We must be about the same age, and your post made me think about my old black leather jacket hanging in my closet…so many memories wrapped up in that. Might just have to write about it! Thanks for sharing your story. My LL Bean Coat is a Carhartt. It hangs in my shop, and longs to be used every weekend. Touching story. Good read. Glad you found happiness in hanging your coat. To my English mind you are that guy and not because of the coat, but because for me the coat was made for guys like you. Your blog is a slice of America Pie and always a great read and that last line… pure American wisdom. when I started writing this I had no idea what direction I was going, then I really struggled with how to end it. Then that last line came out and I knew I had come up with something pretty good. That’s a great feeling! Thanks as always for reading. I love this article. I don’t own this type of coat…but back when my dream was to be a veterinarian, and I was 10 years old, but dad got me a lab coat. I still have this lab coat, even though it doesn’t fit my 25 year old self. It means more to me than just a white coat. It was a dream. And though I don’t want to put in the 12 years of school it takes to become a veterinarian now, I am aspiring to be a dog trainer. This coat means dreams can come true… It’s my hope. Thanks for sharing! What a fun nostalgic trip. Love it, this is a great tale of a piece of clothing that has become a part of a person. I have a few things that are like that for me, and I want to thank you for sharing this and allowing me to think on my own experiences. Objects, like coats, help to add to the story of our life. Thank you for a lovely written story about a treasure. Things do matter, we just need to really to be aware of what they will add before they become part of our life. Just found you through Margie’s post. I’d say congrats on FP, but, sadly, that means you are out of her club. By the way, I have an old L.L. 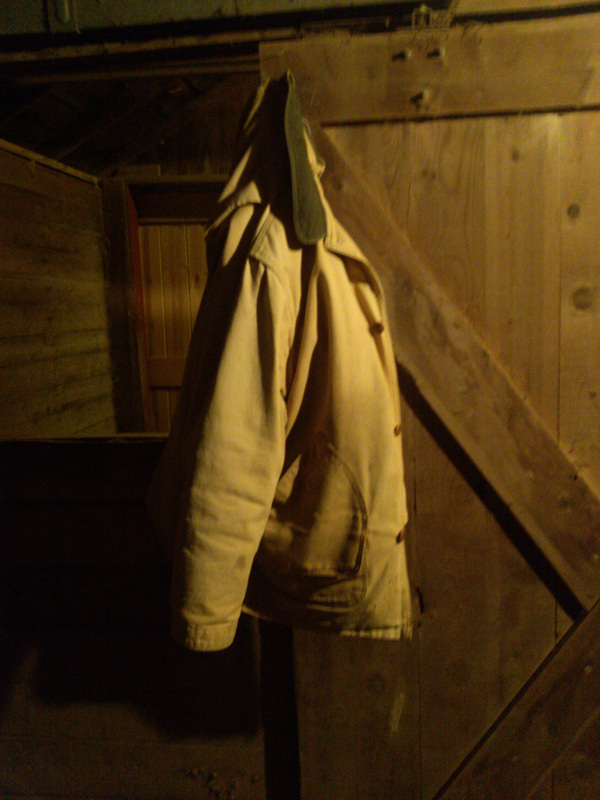 Bean barn coat that same khaki color with the green corduroy collar. Have worn it and loved it for years. It’s my coat of choice when we go to the movies because I don’t mind spilling popcorn on it. Great post, Steve. Thanks for visiting and your nice comments. Yeah, Margie and I have been blogging buds for quite some time. Glad you found this post! So true… Thanks for sharing. Hi Robyn, thanks and you’re always welcome here! Glad you found the post, was quite the whirlwind of activity for a week or so. Steve! It finally happened! Congratulations! Is this the one you wished it would be? I think it is pretty lovely. So proud of you! Thanks. Is this the one? I don’t know, I’ve joked about no longer having the “never pressed” schtick to work with. So many people comment that their pressed posts aren’t their best work. I think this is a great post. But honesty when I wrote it didn’t think much of it until the last line came out and then I thought, wow this is a really good post, I bet it will get a good response. And it did! Anyway it was fun while it lasted. Now onto bigger and better things! Great post. I bought a coat that I really liked at an outdoor store in Klamath Falls, Oregon, back around 1976. I was out there visiting my uncle who had a farm down by Keno, OR. My wife wonders why I keep it around (since we live in Florida). Can’t seem to get rid of it…too many memories. Thanks W E. Good quality stuff is hard to find these days. Hang onto that coat! Oh, I love your post. Isn’t it funny how we must all have a ‘coat story’ in our lives? The one that comes to my mind was one that I put on layaway in a high-end department store when I was 19 (I think I was trying to do an Audrey Hepburn sensibility then). It was a long red, wool coat and cost (then) $120 that I think it took me six months to pay off. It was a beauty! I really love ‘classics’ in clothes as well as in life, and your post is wonderfully earthy: The Barn Coat. I’m sure it kept you warm on those cold and frosty winter mornings in the barn. Thanks for the great images and story. I read this post a while ago on the Freshly Pressed page and I really enjoyed it, Steve. I didn’t “like” or comment on it because I didn’t want to be one of those people who was trolling the FP posts commenting and liking posts just to get followers in return or whatever. I thought you were probably more mature than you really are so I didn’t bother you with a comment, but now that you’re a blogging buddy I wanted to tell you that I thought this post was great. It’s funny, but another blogger I like posted today about her barn coat that she’s fond of and it reminded me of this one. I didn’t remember that you had written this, so I’m glad I was able to find it. Thanks Don! Mature?!? Yeah not so much typically around here… lol! This post was though and probably one of my better ones. Thanks for revisiting. I’d be curious to read your friends barn coat post if you don’t mind sharing the link. They must be pretty kickass coats!